I've made a few of these now and LOVE them! 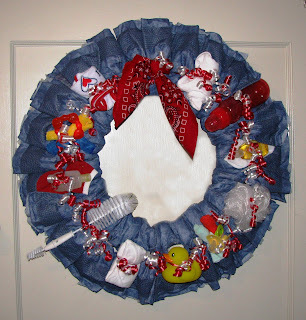 They are so cute for a boy wreath, but I'm dying to make a cowgirl wreath too! I really wish I would have taken a picture of the one I did in jeans with yellow and orange. Too cute! They are also at Smith-Rexall Drug in Pleasant Grove, Utah. Or I'm happy to make one and ship it to you! $40 each at SRD, plus s/h if I ship it.